The Old Silk Mill in Blockley, Gloucestershire. The Old Silk Mill in Draycott Road, Blockley, Gloucestershire, is as characterful as its name suggests. It dates back to the 1700s and was a silk mill up until the 1880s. With its wonderful old buildings and mill race and pond, it is no wonder that the actor, dancer and scene painter Fred Storey, who lived there up until his death in 1917 (when it was also known as Sleepy Hollow), used it as a set for his silent film of Washington Irving’s Rip Van Winkle which came out in 1914. 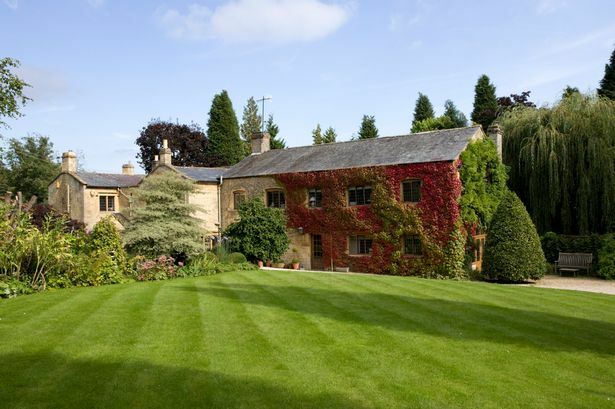 Set within beautifully landscaped gardens, The Old Silk Mill sits beside Blockley Brook. The mill race and pond are controlled by a modern sluice gate. The house is built of local stone beneath a slate roof with mullioned windows and boasts beamed ceilings, exposed stone, panelling and open fireplaces with stone surrounds. It has an oak front door which opens into an impressive entrance hall with stone flagged floor and a guest cloakroom with toilet and basin. Facing the entrance is a cosy snug/library which has an attractive stone mullioned bay window and open fireplace. Adjacent is the Georgian panelled dining room with wood flooring. French doors open to the terrace at the back overlooking the mill pond and race. The dining room links through to the tiled kitchen and additional eating area. It has painted wall and floor mounted units, a pantry, gas fired Aga and Belfast sink. This links into a useful utility room with a door out to the terrace. At the other end of the entrance hall is a drawing room with an open stone fireplace, window overlooking the front garden and French doors to the back. On the southern side of the house, a separate door opens into an entrance lobby with a second cloakroom and door into a large bright triple aspect sitting room with a log burner and French doors onto a sunny garden terrace. A recently upgraded and fully equipped kitchen means it could be used as a separate annexe or for rental accommodation, combined with the bedroom and bathroom above accessed by a secondary staircase. Back in the main part of the house there are four double bedrooms. Two of them have well equipped en suite bathrooms, one has a free standing bath, twin sinks and a toilet. The other has a bath, sink, toilet and bidet. The other two bedrooms both have sinks in the rooms. The family bathroom includes a bath, basin, toilet and bidet. A small study over looking the front garden completes the accommodation on this floor. Outside the house is approached through a pair of stone pillars with oak gates. A gravel driveway leads to a large parking area with space for a number of cars and an adjacent double garage with loft storage space, a sink area and gardener’s loo. The Old Silk Mill has particularly attractive grounds which have been elegantly landscaped to set off the stream and spectacular pond area with a south facing summer house over the pond. The gardens are immaculately maintained with an area of lawn and an orchard beside the driveway. A variety of mature trees, shrubs and borders are divided by bridges leading over the brook. Stone terraces provide different areas to sit as pathways meander through the flower beds and lawns. At the end of the garden are some open-fronted old cow sheds and a gravelled area with seating and raised vegetable beds. This area provides a useful storage and working space with running water. Beyond is a gate on the boundary of the property allowing uninterrupted access up to the Cotswold Escarpment. The land covers 1.2 acres in all. The ancient north Cotswold village of Blockley has a unique collection of buildings and cottages. Several mills alongside Blockley Brook reflecting its heyday as a centre for the silk processing industry in the 18th century. Most of Blockley’s mills, including the Old Silk Mill, were converted into domestic residences about 100 years ago. The village is well served with primary and nursery schools, a church, two village pubs and a community shop with post office and café which has just been awarded a £500,000 national lottery grant. Other amenities include a bowling club and children’s playground. The old market towns of Moreton in Marsh and Chipping Campden are both within easy reach. Cheltenham, Oxford and Stratford-upon-Avon offer a diverse range of shopping, recreational and educational amenities.